Looking for some more ideas for summer activities? Here are a few from a guest writer. The last bell finally rings and students rush out the school door toward summer. Excited for the warm weather and the illusion of freedom, they grab their bicycles and head for the sprinklers, but sadly, after a week or two, they're riddled with boredom. Solving summertime boredom doesn't have to be difficult or expensive when you try some of these simple, inexpensive ways to make sure kids have a well-rounded summer that primes them for a successful school year. Read on for some simple ways to help kids beat the summer blues. A big complaint schools have with summer break is that too many kids return to their desks in the fall having forgotten much of what they learned the year before. Keeping your child's brain active during the summer months helps to ensure they can return to school ready to learn, and it doesn't require kids to sit and study in July or flip through flashcards at the swimming pool. Parents can stimulate children by doing a few small and simple exercises with them, citing an article from Fox News Denver. Activities that combine back-and-forth motions and balancing can promote spatial awareness in children and give both the right and the left sides of their brains a workout. Watching documentaries is another great way to keep your child learning during the summer, and there are plenty to choose from through programming provided by Cable-TV. Cozy up on the couch after a hot day to watch a nature documentary or even an episode of “MythBusters” is a fun way to learn. One way to get children active is to show you have fun exercising, as well, by playing with them. Citing a 2012 study by JAMA Pediatrics, academic performance is positively related to physical activity in children. Although your child may not want to admit it, they probably love to play games with you, as well. Organizing a sports night is a great way to pass the summer evenings while getting together with family and friends. Most city parks have soccer fields or baseball fields that are perfect for a casual game of soccer or kickball. To ensure the fields will be free, contact the parks and recreation department in your city first. 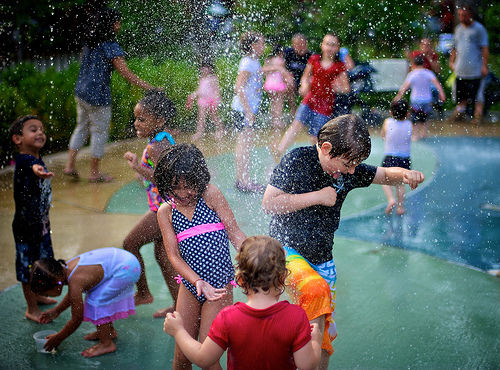 Businesses tend to offer free products and services for children during the summer. Bowling alleys usually offer free games if you rent shoes while movie theaters might show older movies for just a buck or two. Contact your local zoos and museums to see if they're hosting any free days during the summer months, suggests AARP. If your kids like to be outside, you may want to take them fishing. For the cost of a simple rod and reel, your child can enjoy a summer's worth of fishing, and in most areas, children don't even need to have a fishing license. Although some boredom can be an invitation to creativity, too much boredom can make kids unbearably whiny. How do you keep your kids entertained on a budget during the summer months? Image by Josh Engroff pursuant to the terms of his Creative Commons license.